This breaker is designed for use on excavators in the 13 to 22 ton range and FRD pedestal systems. 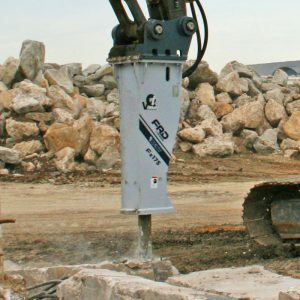 The Fx175 Qtv is ideal for roads, bridges, rock, utility applications, and in quarries. Incorporating the latest in design technology, the Fx175 Qtv hammer improves day-to-day performance, offering less maintenance and downtime, smoother operation, superior strength and the highest level of reliability. The new Fx Series for excavators has eliminated a problem that has long plagued the breaker industry– thru-bolts. Our new large series of hydraulic hammers are designed without thru-bolts and all the problems that go with them. The Fx175 Qtv offers improved durability, with features that include a square, mono-block body design for superior strength. The elimination of thru-bolts also reduces maintenance and eliminates failure. 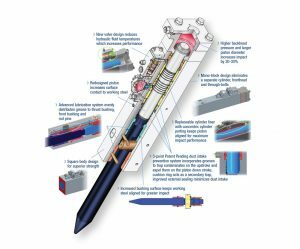 A patent pending dust prevention system incorporates grooves to trap contaminates on the upstroke and expel them on the piston down stroke, while a cushion ring acts as a secondary trap. This improves the life of the piston, bushings and working steel. The Fx175 Qtv is also designed to accommodate automatic lubrication systems for quick daily maintenance. Excavators equipped with quick couplers can take advantage of our Floating Top-Mount Boss mounting system. This incorporates standard mounting hardware while meeting “OEM Pin Centers” for specific carrier mounting eliminating the need for specific OEM top caps. All hammers come complete with our exclusive Pro-Pak for ease of installation. The Pro-Pak includes hose whips, mounting hardware, standard working steel and tool kit with operating manual at no additional charge. Impact energy class 3,250 ft. lbs.